You’ve got the idea, and we’ve got the team who can make it a reality. We have a wealth of experience designing stunning web and desktop applications and have the portfolio to prove it. In addition to our client work, ENTP is the team behind the highly popular Lighthouse and Tender Support. 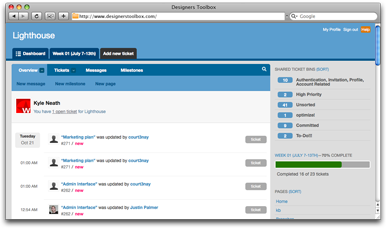 Lighthouse is used by teams big and small to collaborate and manage projects of all sizes. It is unique in that it allows you to open your projects up to the public. Whether you’re working on an Open Source project or running a public beta of your very own product, public projects allow you to collect valuable feedback from the people involved. Lighthouse was created to be simple to use, with nothing to install. It was born out of a real need, and is something we’ve been using for our own development for several months.